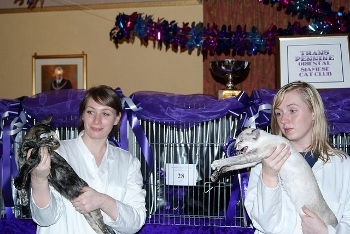 Stewarding at a cat show is a great hobby and is a fantastic way to meet other breeders and exhibitors. I have really enjoyed showing my cats and have met a lot of friends there along the way. A lot of work goes into the running a cat show and I decided that I would like to be involved. And so I started stewarding for judges at cat shows. A steward is assigned to a judge and must always wear a white coat. They are there to assist and help the judge by getting the cats that are to be judged out of the pens, as well as to ensure that everything is disinfected between cats and to hand in the judges paperwork as the classes are being judged. It is the steward’s job to fetch the table and take it round the show hall so that it can be used if required when judging the cats. I have stewarded for a number of different judges in most of the different sections. I quickly learned that each of the different breeds of cat need to be handled in a slightly different way and each judge has his or her preference. I have found that it is good to ask each judge how they would like their cats to be handled right at the start of the day. As an exhibitor and breeder of Siamese and Oriental cats, the Siamese and Oriental sections are always my favourite. After establishing how the judge would like the cats to be handled it is important to do so in a way that causes the cat as little stress as possible. All the cats should be handled confidently and gently. Try to imagine how you would want your cat to be handled. Always keep the cat’s pen door open and stand in a way that makes it easy to put the cat back should the cat become agitated. The first couple of times that I stewarded I felt rather nervous, but I needn’t have worried. After explaining to the judge that I had only stewarded a couple of times the judges were very patient with me and explained what was happening along the way. I have found that the judges encouraged my interest in the cat fancy and have been very helpful and understanding. If you are stewarding for the first time at a cat show there are a few things that you should remember to bring. First and most important is your white over coat. Not only does your white coat make you easily recognisable but it also prevents cats from touching your own clothing. You will also need to bring a couple of pencils or pens, so that you always have a spare should your judge need one, or yours runs out. It is also a good idea to bring a couple of plasters just in case a frightened cat catches you with its claws. I have found that, whilst enjoyable, stewarding is very tiring work. Judges tend to be very busy all day so physical stamina is required. A steward is on their feet nearly all day and needs to concentrate on what is going on. A steward’s work begins before judging even starts to take place as the classes need to be looked through. Any cats that are to be judged twice are marked with an ‘X’ to indicate that this cat has already been seen. For me, stewarding at a cat show just adds to the pleasure of attending. It is a lot of fun, albeit hard work, and keeps you busy in the long afternoons at a cat show. If you are able to steward for a judge in the section of cats that you breed or show then this can give invaluable information. I have learned such a lot about my chosen breed of cat and this has helped me when assessing the kittens that I breed. Listen carefully to the judge’s verbal critique and take in as much as you can with regards to what the judges are looking for in a good show cat. I have always found that the judges are more than willing to answer any questions I have after they have finished the class. Taking in this information has helped me to begin to understand the standard of points. I have learned so much in just a couple of years of stewarding occasionally at cat shows. All the hard work is most certainly worth it. So, if you feel like you would like to have a go at stewarding at a cat show what do you do next? Firstly they could be arranged via a show manager, especially if you belong to the club arranging the show. If you know a judge personally then why not let them know that you would like to start stewarding and make arrangements that way. If you would love to give it a go but just don’t feel confident enough at first then try second stewarding. A second steward will accompany a judge and their steward and take the opportunity to learn as much as they can without the pressure. Tina is Siamese and Oriental cat breeder and regular contributor to Siamese Cat Breeder. Breeding and showing her cats and kittens under the prefix Mullsi, Tina can often be found at Cat Shows.